Let me be clear--this recipe was not supposed to happen. It's an accidental riff on this fresh, minty, delicious salad I got to test many months ago from Yoga Journal. In this original, bulgur delectably pulls off its trademark way of delivering hearty goodness with a sense of lightness. In this recipe, it's like tabbouleh with sweet twist. If you have a chance to make it, I recommend you do so, soon. Spring is here. 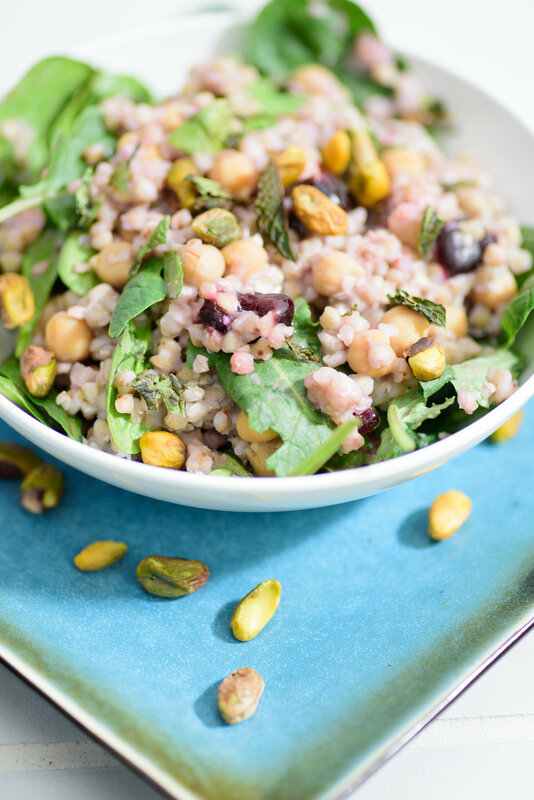 On the other hand, maybe you'll have it in the back of your mind that you might throw the above salad together, but you'll find that instead of bulgur, you have buckwheat. Don't deceive yourself that this is a straightforward swap when it comes to ultimate taste, but don't be deterred either. Buckwheat may just be one of the most nutritious, cheapest under-the-radar foods you can throw into soups, stews, and casseroles on a whim. A seed versus a grain, buckwheat is gluten-free rich in nutrients, including those Bs. I'll be the first to admit, my favorite form of buckwheat has tended to be flour, in pancakes. My second favorite, I'm a little embarrassed to admit, has been tossed in the slow cooker with vegetable chili, cooked till it gets mushy and unrecognizable. Thickener versus actual ingredient. Chili porridge--sounds bad, but tastes good, really. But actually, buckwheat can be fluffy, if you want it to be! Typically it comes pre-toasted, and all you need to do is bring to a boil in water at a 2-1 ratio, simmer 10 minutes and let rest, covered, about half an hour. Then, toss with whatever you like and enjoy--hardy, fluffy and chewy all at once. Place 2 cups of water in a medium heavy bottomed sauce pan, and bring to boil. Add salt. Add buckwheat groats, cover tightly, bring to strong boil again, reduce the heat to low. Simmer covered (without opening the lid) for 10 minutes. Remove from heat, stir gently with a fork, cover and set aside to rest for 30 minutes. Prepare the dressing: whisk together cider vinegar and honey in a small bowl. Stir in cherries; let sit 30 minutes. Strain cherries, reserving liquid. In another bowl, combine yogurt, turmeric, and salt to taste. Add reserved liquid to yogurt and whisk to combine. In a large bowl, combine buckwheat, greens, nuts, chickpeas, and mint. Pour in half the dressing and toss to coat. Divide into individual servings and drizzle remaining dressing on top.